Attorney: ...now in your opinion, do you believe that you could produce seven wells in question here today in--in paying quantities? Hall: It would pay to me. 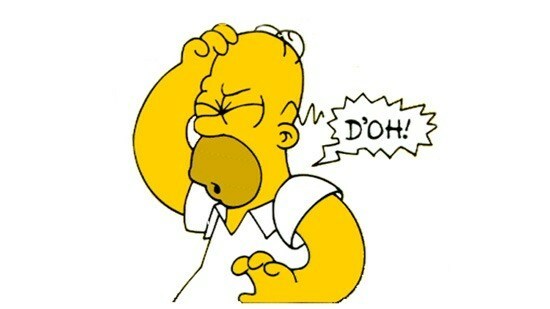 Homer often confuses the words "yes" and "no" too. Not that Hall! Anything but that. You just agreed with the defendants' case (that the leases were commercial when the wells were shut in). And when you agree with the defendants' argument and then you lose the case in district court and then appeal the case to the Supreme Court of the State of Oklahoma and the Supreme Court of the State of Oklahoma takes the case and then issues its opinion, it's going to use that fouled off slow-pitch softball in its decision to uphold the judgement of the district court. By quoting, "but perhaps the most convincing testimony was the following exchange between Hall and his attorney" (see above for that exchange)...and, "the judge seemingly relied upon this admission in reaching his judgement." "Seemingly" seems a bit gentle, but nonetheless, Hall lost (on most of the issues). Berlin was hoping that Hall v. Galmor would carry a bit more water in helping craft the future of these lease cancellation suits. The courts are still waffling around "capability" language, but in an interesting twist in this case, they opined that a well only has to be capable at the time the well is shut-in and that the operator (or its successors) do not have a duty to maintain the shut-in well. This is a bit odd in Berlin's view as it penalizes mineral owners which Oklahoma courts tend to not do. Either way, Berlin is certain there are many out there who will claim that Berlin is incorrect and it is in fact a landmark decision and Berlin would welcome your comments and debate below.